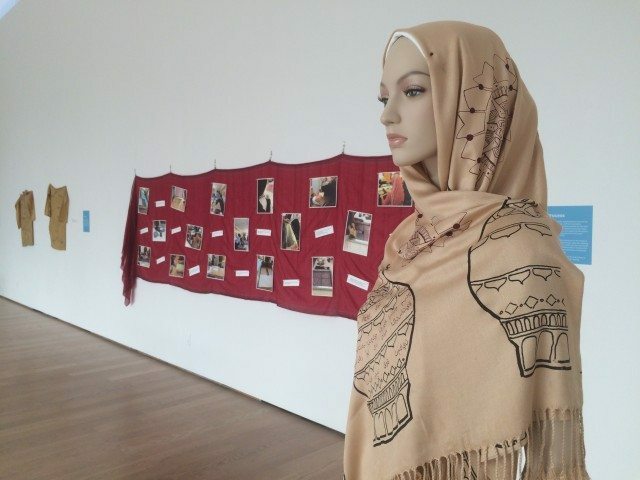 Silkscreened hijab on display in the Gardiner Museum’s special exhibition hall. Photo by Samira Mohyeddin. Terrorist, dirty, oppressed, ignorant: these are just some of the words that Muslim women say are often hurled at them in Toronto. These are also some of the words you will see written on works of art by those same women. On display at the Gardiner Museum this week, Respect, by the South Riverdale Community Health Centre aims to put the stigma and Islamophobia faced by Muslim women in the spotlight through art. The brain child of Gurpreet Karir and Wanda Georgis, both non-Muslim social workers at the community health centre, Respect was born out of the niqab debate that took place in Canada during the Harper government, their own work with Muslim women in the Danforth and Jones Avenue neighbourhood, and the harassment and physical assault that some Muslim women are facing in Toronto. “We were wondering how [Muslim women] were doing in this climate and how their children were doing. We were trying to think of a way to get them talking about these issues,” Karir says. The project proved difficult at first. Karir and Georgis did not anticipate some of the anxiety and apprehension that the women had speaking about their experiences. Participants say they’ve heard several upsetting stories of Islamophobia from other Muslim Torontonians: those who wanted to change their names to avoid persecution, community members who were harassed on public transit, and many who felt anxious just leaving their homes. 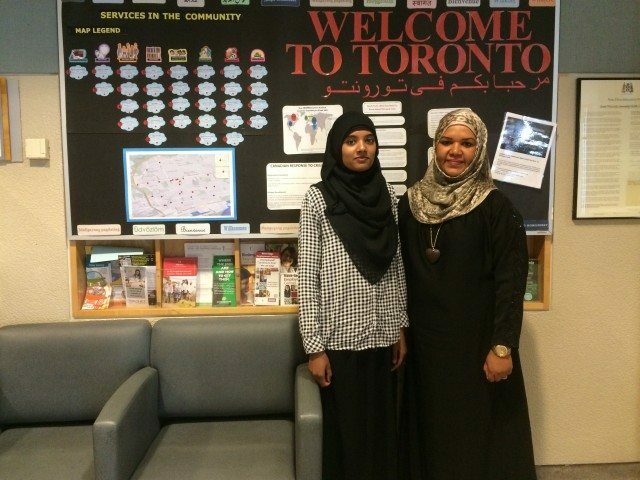 Fatima Khan, left, and Salha Al-Shuwehdy at the South Riverdale Community Health Centre. Photo by Samira Mohyeddin. One of the participants, Salha Al-Shuwehdy was hesitant to join the project when she was initially asked. Never having done any art, let alone silk screening, she did not know what to expect. She now credits the project with helping her find her voice. And that’s the purpose of the project: to bring the voice of Muslim women to other communities in Toronto. While Respect is currently on display at the Gardiner Museum, part of the project—silk screens created by Muslim women including Al-Shuwehdy—was first exhibited last year at the Carrot Common in Toronto’s east end. Just like the Gardiner Museum, none of the participating women had ever been to the Carrot Common, and their one-day exhibition on the rooftop there proved to be a conversation that they wanted to continue to have. “I told my husband, this is not the end of this project,” Al-Shuwehdy says. A year later, a new, younger group of Muslim women began exploring issues of stigma and Islamopohbia through silk screening messages written on hijabs that they designed at the community centre. 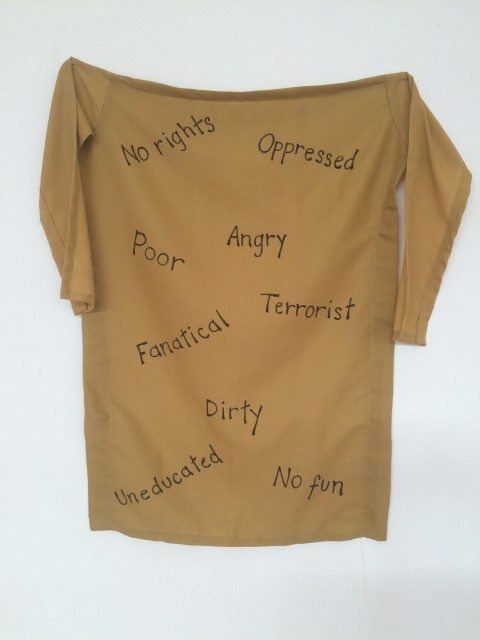 A traditional Kameez silk screened with words used to describe Muslim women on display. Photo by Samira Mohyeddin. Twenty-year-old Fatima Khan, a Ryerson University student whose mother participated in the first phase of the project, jumped at the chance to take her message outside of her own community. 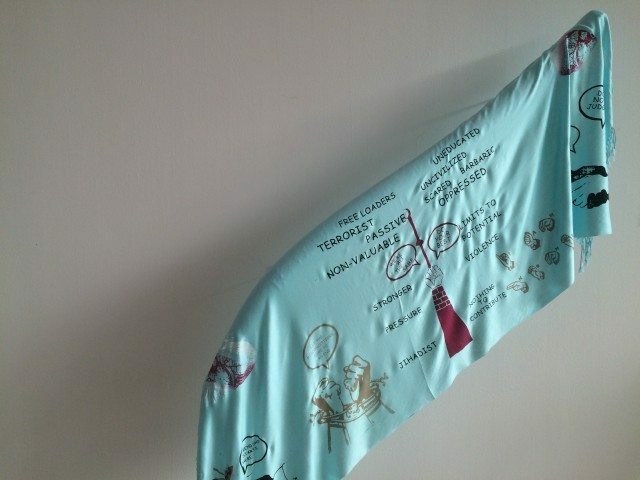 One of the silk screened hijabs on display. Photo by Samira Mohyeddin. “When the attacks happened in Paris last year, my mom told me to stop taking the TTC for awhile because she was afraid everybody would blame all Muslims for what happened,” Khan adds. After the second group of girls were finished their silk screens, Georgis and Karir once again began the difficult task of looking for a space to exhibit the works, stumbling upon the Gardiner Museum. Through an open call for proposals, the South Riverdale Community and Health Centre applied to be a part of the Gardiner Museum’s summer-long Community Arts Space Program. And while Respect is far unlike the usual clay and ceramics that patrons are used to seeing, the Gardiner Museum was keen to host the exhibit. Making art accessible to people and communities who wouldn’t normally be attending exhibitions and openings, let alone exhibiting their own works, is what is so transformative about this project. South Riverdale Community Health Centre provided the means and Gardiner Museum provided the space for Muslim women to share their stories and their hopes for a more inclusive and welcoming Toronto. In light of this, a special message from Prime Minister Justin Trudeau will be read at a community celebration of the exhibit Friday. Respect is on display until Sunday, July 24, and admission is free.